If you're currently storing your patient information on local servers you can only access from your office, you could be wasting precious amounts of time and money. Server-based EHR's can limit your efficiency, mobility, and finances. However, cloud-based software can solve these issues if you're looking for a new EHR software. Scared to take the plunge into cloud-based optometry software? We've listed the major drawbacks to your legacy EHR software to help you understand if an upgrade is the right decision for your optometry practice. Read on if you're curious to know why your server-based EHR software could be limiting your growth. Setup and maintenance is expensive. As you may know, the up-front costs of actually purchasing the server, licensing fees for all staff members and ODs, and setup fees can quickly amount to over $15,000. Then, you have ongoing IT support, training fees, and maintenance fees for the complex initial setup as well as regular monthly upkeep and software updates. Not to mention, you have to account for the revenue you lose when you close your practice for these updates and technician visits. Use our comparison tool here to see how much you actually spend (and how much you can save) on your EHR software right now. Maybe you've crunched the numbers and feel comfortable paying most of the fees up front for a high-quality EHR that you can rely on. Well, server-based EHR's frequently experience issues with software updates and backups that become your responsibility to fix. If you experience a bug or your optometry practice floods or a hacker gets into your system, no matter how quickly a technician arrives, you might have already exposed or lost some patient data. 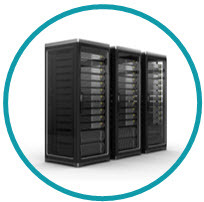 Most importantly, servers are limited because they can hold a finite amount of data, so you would need to purchase additional hardware space in the likely occasion that your practice, team, and client-base grows. Furthermore, if you were looking to implement a new EHR solution, you're probably bound by an annual contract that is expensive to break. We hope we've provided you with some food for thought once you reach the end of that contract and realize it's time to upgrade to a more flexible solution. You can't access it outside of work. Though it may seem like not having access to your patient records outside of work helps you achieve that coveted work-life balance, it does quite the opposite. Because you're tied to your server, you wouldn't have the flexibility to leave the practice to deal with any emergencies, work from the comfort of your own home, or travel. With cloud-based servers, you and your staff can conduct any administrative work from your home and eliminate the overhead costs of having your practice open when you aren't visiting clients. With cloud-based EHR solutions, all your client data and exams can be accessed on a user-friendly platform and conducted with fewer clicks from any device with an internet connection. Also, cloud-based EHR's will save you money in the long-term because they can be implemented immediately with a monthly subscription fee and no hidden maintenance costs. To learn more about your cloud-based EHR options and implementation, you can read the wealth of resources we have on our blog here.